Recently I needed a replacement brush for my Clarisonic Mia 3 and a new BB Cream so I headed to Sephora's website to do a little shopping. Of course once I got to the website I found a few other items that I just had to get, does this ever happen to anyone else? 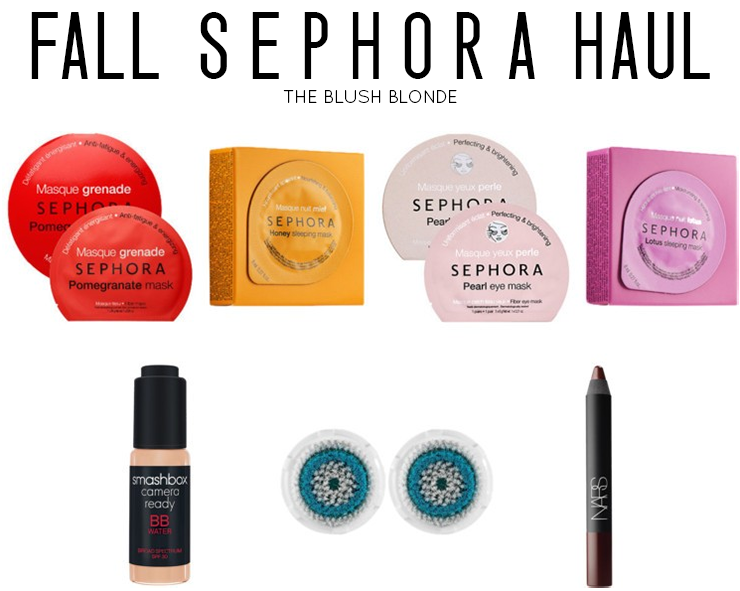 Below are the products that I picked up during my mini Sephora shopping spree. When Sephora came out with these sheet masks a couple months ago I picked up the Pearl and Honey Masks and loved both of them. This time I went with the Pomegranate one because it "awakens, energizes, and protects the skin with antioxidant-rich natural pomegranate extract." My skin has been seeming a little dull lately so I thought that this would help to perk it up. I can't wait to use it and my tip for these masks is to put them on while you're taking a bath, then sit back to relax and enjoy! I've been dying to try a sleeping mask and couldn't resist them at only $4.00 each! I am obsessed with using honey for beauty so I couldn't resist purchasing this. This mask is meant to nourish and balance your skin while you leave it on all night,. I'm looking forward to using this in the winter when my skin is dry and in need of some serious nourishment. Since I loved the Sephora Sheet Masks so much I knew that I had to give their sheet eye masks a try. I have dark circles under my eye and the Pearl Mask is meant to help brighten the skin so that eyes appear lighter, so it was an easy choice for me. I'm excited to see how these work and will definitely be doing a review on them! Like I said before for only $4.00 each I couldn't resist these little pods filled with an overnight mask. I also picked up the Lotus mask because it locks in water and minimizes the look of fatigued skin, both of which I think will benefit my skin in the fall and winter months. For my BB Cream I originally purchased Sephora Collection Skin Perfect CC Cream in Fair because it was a great price and had gotten really good reviews, however when I used it it turned my skin completely orange so it had to go back. I took it back in store and had one of the ladies that works at Sephora help me find something different, she recommended a few different BB Creams, but I fell in love with this one. It is actually a 'BB Water' not a cream, that is super silky and moisturizing, and you only need one drop for your entire face. They also had a great selection of colors and the fair matched my super fair skin perfectly. I haven't actually had the chance to use it on my whole face yet, but this will definitely be getting a full review when I do! I love the Deep Pore Brush Head for my Clarisonic, it exfoliates my skin very nicely and cleans out all of my pores. I was happy to see that Sephora had the two pack because individually the brushes are $27.00 each, but in this pack they come to $22.00 each so I saved $10.00! If you have a Clarisonic and haven't tried the Deep Pore Brush, I recommend doing so. I love a super dark matte lip for fall and winter, which is exactly what this creates. I got this specific lipstick because Jordyn wears it all the time and I'm always complimenting her on it so I figured I needed to get one for myself. I've only worn it once so far, but I got so many compliments on it and am in love with it! What are your favorite things to buy at Sephora? 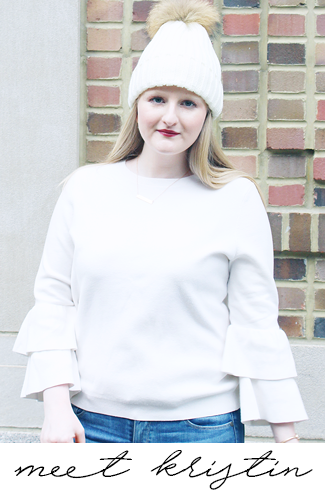 Today I'm linking up with WIWW and WIWW. SUPER excited to read your review on some of the items! I've been looking up different ways to get rid of dark under eyes so I need to purchase that mask and the bb cream water sounds incredible! I want to try one of those masks, and I'm glad to hear they work well. I can't wait to read your review of the other one and need a new fall lip color. I love the Nars pencils! Ugh, now I want to try all of this out! Can't wait to hear how the masks work!